I recently had the pleasure of watching Improve Photography’s “Lighting in a Flash” video workshop, wherein, Jim Harmer teaches the fundamentals of flash photography. I highly recommend purchasing it if you are interested in using flash or especially if you are struggling to get the results you’re looking for. It’s only $50 and is jam-packed with valuable information. In one of the video’s segments, Jim does a photoshoot with his kids in karate outfits. He shows you exactly how to set up the lights and explains the advantages of using a softbox for the main light. After setting up the lights and adjusting the power output, the kids stepped in and struck a pose for the camera and in just a few minutes, Jim comes away with some awesome results. Watching this inspired me to try it for myself and it’s your lucky day, because I’m going to tell you how I did it. 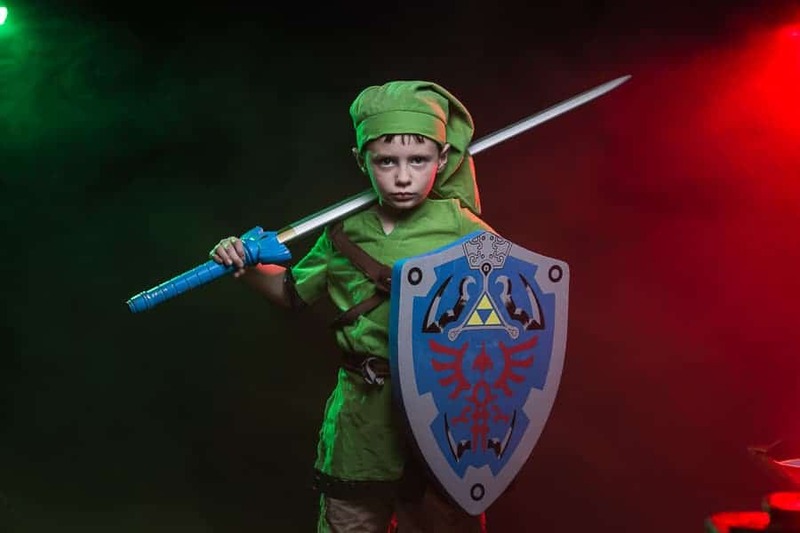 My son is obsessed with a lot of things, but one of his favorite obsessions is Legend of Zelda, so when I saw Jim’s awesome photoshoot, I knew what I wanted to do. 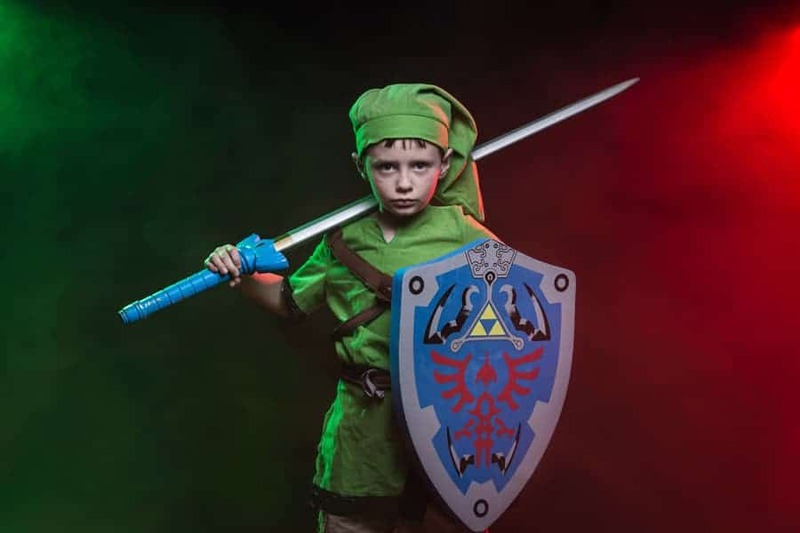 My son recently got a Link costume for a mother-son “Super Hero Bash”(Link is the main character in Legend of Zelda…helpful hint: Zelda is the princess). Naturally, my son was ecstatic about dressing up again and doing a shoot. We somehow lost the leggings for the costume, so he threw on some shorts and I shot mostly from the waist up. I listed the black backdrop as optional because, in the video, Jim simply overpowers the ambient light to make the background go dark. I didn’t have enough space to do that, so I had to use the backdrop crammed into our small living room. 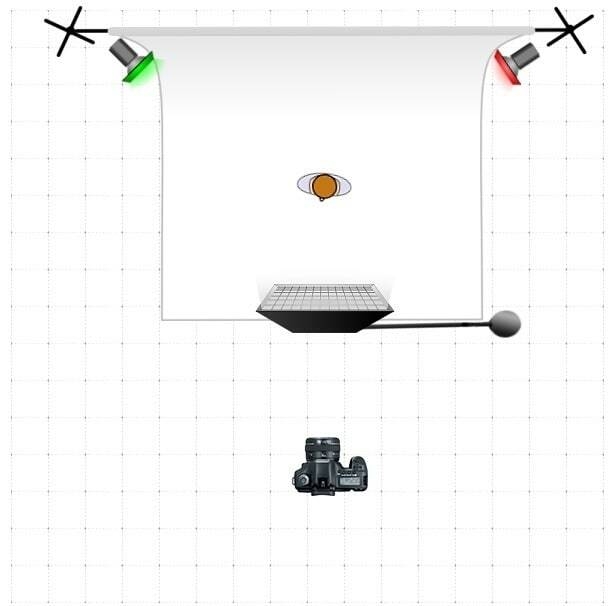 I set up the backdrop, two gelled flashes on stands, and a gridded softbox on a boom arm. 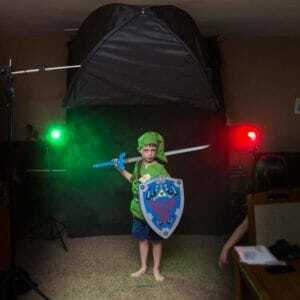 Putting a grid on a softbox prevents light from illuminating everything by focusing the light on a more limited area. I gelled the flashes green and red because green is a primary color in the Legend of Zelda color scheme and red because red is simply complementary to green. Red is also pretty dramatic. Next, I decided where I wanted my subject to stand and marked it with a piece of gaffer’s tape so the two gelled flashes would be aiming where I wanted and so the light intensity from the softbox wouldn’t vary (I really wanted to get it right in camera – some things you can’t fix). I also zoomed in my flashes a bit (to 35mm or 50mm) to try to reduce light spill from them. I mark the floor whenever I’m doing a shoot like this – for me, this means business portraits, mostly. You should do as much as you can before you have anyone step in so your subject or client has to wait for as little time as possible. I had little Link step up to the tape to do a few test shots. First off, my camera settings were: ISO 100 – I wanted my ISO as low as possible to make my ambient exposure pretty much black before adding the lights. My shutter speed was 1/160 because that is my camera's flash sync speed (technically it's 1/180th) and I want it high for the same reason I want the ISO low: to keep my ambient exposure dark. My aperture was f5.6 – I arrived at f5.6 somewhat arbitrarily, honestly, but it was a good starting point for adding flashes. Basically, I was looking for three things: First, I wanted to make sure the background was dark – in other words, invisible. Second, I wanted my gelled flashes in the background not to be too bright. If they’re too bright, they’ll overexpose the parts of your subject that they’re only supposed to be adding accents to. If you have some kind of Highlight Alert turned on in your camera’s settings, the over-exposed parts of the image should blink allowing you to easily correct the problem. Third, I want my softbox directly in front of my subject and above his eye-line, aimed downward, probably at about forty-five degrees. If you set the light up to one side or the other, it might interfere with the colored accent lights and it’s also not the look I was going for. If you look at the photo closely, you can see the telltale shadow under his nose and a little bit in his eyes. Every person is different, so you might need to have the light higher or lower to accommodate their facial shape. Just watch the shadows and try to aim to get a small shadow under the nose. Adjust brightness ‘to taste’. Applying the fog properly is essential, too. Avoid spraying it in front of your subject as it will not only decrease contrast and detail, but because it can catch some of the light cast by the flashes. I know it’s difficult, as time progresses, to contain the fog to a particular area, so try to move quickly. Only after everything was in place and adjusted correctly, I sprayed my Atmosphere Aerosol toward the backdrop, behind my subject, until I could see a haze start to develop. I ran back to the spot I wanted to shoot from and took several shots. An assistant would be extremely helpful in this situation. I wasn’t quite happy with the results, so I adjusted his pose a little, sprayed some more fog, and tried again. This time, we got a winner. My wife was on the way home, so I hurriedly dismantled the make-shift studio and moved on to editing. I can’t recommend highly enough the $10 a month Lightroom + Photoshop bundle from Adobe. It’s an extremely good deal and there’s really nothing better than this combination, in my opinion. Because we got most of the details right in-camera, I didn’t have much post-processing to do. I imported the photos into Adobe Lightroom, applied a basic preset that has my essentials programmed in: Some minor tweaks in the Basic panel (excluding exposure and color temp/tint) and sharpness, noise reduction, etc under the Details panel. The only other adjustments I made in Lightroom were the following: Temperature and tint, of course, an increase in contrast and clarity, and a decrease in vibrance. And, as Nick Page says, you only want to sharpen specific things – not everything, so make sure to increase the ‘masking’. To do this, go to the Details panel, hold the ALT key (Option on Mac) while moving the slider to the right. Whatever is white is getting sharpened, so when everything goes black except for your subject, then you’re good to go. I have mine set to around sixty-five. I then did some selective changes with the Adjustment Brush (hotkey: K): I did a small amount of skin smoothing, brightened up his shield, decreased exposure on the red side of the fog, and increased exposure on the green side. It turns out that the green gel decreases my light output far more than the red gel – that’s something to remember for next time. The last thing I did was to sharpen and brighten Link’s eyes just a tiny bit. Be careful not to over-sharpen or over-brighten the eyes. If you can tell they’ve been sharpened, you’ve probably gone too far. Although, in this kind of shot, you have a bit more freedom than you do in a conventional portrait.